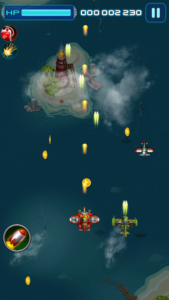 Air Force X – Warfare Is A New Aircraft Shooting Game For Android By OneSoft Studio. Are You Ready To Destroy Enemies’ Aircraft With Bullets, Rockets? Game Info – OneSoft Studio After Galaxy Attack – Alien Shooter Game Launched Another Aircraft Shooting Game “Air Force X” For Android On Google Play Store. Air Force X Is Currently In Early Access/Beta Mode Of Google Play Store. In This Game, You Control Your Aircraft And Defeat Enemies’ Aircraft With Bullets, Rockets, And Boosters. Your Enemies’ Aircraft Will Also Attack On Your Aircraft With Bullets, Missiles. You Have Limited Health, So You Have To Protect/Defend Yourself From Enemies. Before You Start The Game, You Have The Option To Choose/Buy Power-Ups In Exchange Of Gold Coins. When Fight Starts, You Have To Destroy Your Enemies And Protect Yourself. You Can Use Power-Ups In The Middle Of The Battle – i.e. Tap On Rocket To Release Missiles. Increase HP And Damage With Power-Ups. If You Need A Support Then You Should Get A Support Of Aircraft Before You Start The Game. Your Enemies’ Too Have Different Types Of Shots For Attack i.e. Missiles, Bullets. Controlling – Simply Touch And Hold The Screen To Move Fighter Jet Up, Down, Right, And Left. You Can Upgrade Your Aircraft With Gold Coins And Unlock New Jets With Coins. If You Lose All Of You Health Early, You Have The Option To Move Further From That Point By Watching An Ad Or Pay Gems. Collect Coins And Boosters By Destroying Other Jets. Graphics And Controls Of This Game Are Excellent. A Great Time Killer Also. Get Rewards(Coins) By Playing This Game Daily. You Can Buy Or Get More Coins, Gems With Real Money. However, Game Is Free To Play.